Christina R. Deleasa graduated from Montclair State University in 2013 with a dual major in Jurisprudence and Political Science and a minor in Public Administration. In 2013, she also attended The Washington Center in Washington, D.C. and worked on Capitol Hill and for various Think Tanks. In 2017, she received her J.D. from New England Law|Boston where she received the New England Scholar’s Award for ranking in the top 10% of her class. During law school, Ms. Deleasa worked in the Massachusetts State House for Governor Charlie Baker. In 2016, she worked as a student attorney for Greater Boston Legal Services and with the Harvard Legal Aid Bureau in presenting indigent clients before the Boston Housing Court. During the Summer 2016, Ms. Deleasa also worked for the Essex County Prosecutor’s Office in New Jersey where she submitted and argued appellate matters before the Court on behalf of the Appellate Division. During her last year in law school, Christina worked as a student supervised attorney in criminal matters heard before the Boston Municipal Court and Suffolk County Superior Court. She also worked as a civil law clerk on complex civil litigation matters. Following law school, Ms. Deleasa served a one-year judicial clerkship with the Honorable Marysol Rosero, J.S.C., in the Criminal Division of the Superior County of New Jersey (Essex County). 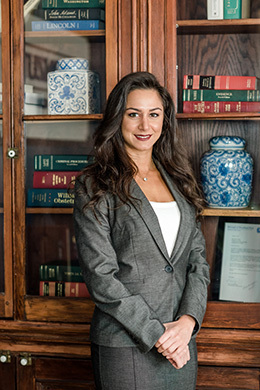 After completing her clerkship, Ms. Deleasa joined the law firm of Fronzuto Law Group, where her practice is focused on plaintiff civil litigation with a specialized emphasis on medical malpractice, product liability and catastrophic injury matters. Ms. Deleasa is admitted to the bar in the States of New Jersey and New York.